This quote by Safer gives an accurate description of millennials; people born between the 1980s and the 2000s; an era of technology revolution, millennials have inherited the best ideas this generation has to offer. Born into technology, raised with a belief in individualism, and pushed into the world to make a difference, millennials form the new task force that demands attention, adventure, and something larger than life. Brought up by doting parents and instilled with the belief of being special with a purpose in life, millennials are always on the lookout for meaning in the work they do. They want to be the next big thing, the next change, and the next revolution - the only problem? The world they currently exist in is still made up of the Baby Boomers who have a completely different way of thinking. They prefer hard work over smart work, long hours over short hours, planning over risks, strategy over drive and so on. Being a millennial myself, I am guilty of these generalizations, and I must admit that we do things differently than previous generations. We want to see results soon, we want to drive change aggressively, and we want to conquer the world. Amidst all this though, we sometimes lack focus, we lack motivation, and we lack the ability to mix smart work with hard work. We also lack the perseverance practiced by our parents while at their jobs. We are constantly bombarded with articles that tell us to quit our jobs and travel, to start our own business, and to live life with a sense of adventure rather than with a sense of paying bills. With these increasing demands of living a different and a presumably better life, we are trying to prove ourselves to be the best at what we do. 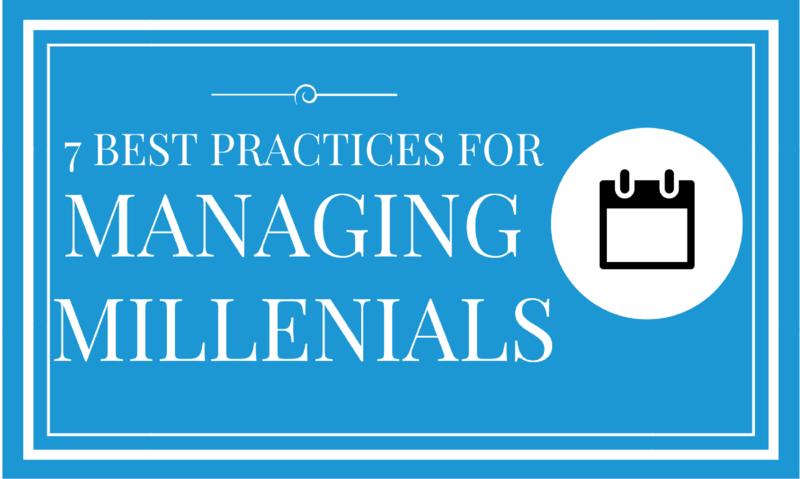 All of this has created a challenge for companies to manage, keep, and motivate millennials. With the contradiction of the past and the energy of the present, how do organizations define the future? How can organizations use experienced wisdom to harness limitless energy? As a millennial, here are a few important suggestions I have for organizations to manage us effectively. Millennials are driven, passionate, and want to see the bigger picture. In fact, they are the best people you can get to solve a huge jigsaw puzzle within the shortest time span possible. You want to harness this energy without being controlling and directive. Millennials want to be trusted by their leaders and look forward to resolving problems through sheer determination. However, they may miss the mark or they may not be able to do their best if they do not get the right kind of guidance and leadership from the people they report to. They need structure and essential project management skills that can be provided through trainings, mentorship, and hands-on experience. This is an ideal situation for experienced professionals belonging to the Baby Boomer age to work in coordination with millennials, each sharing their expertise for the benefit of the company. Organization leaders need to realize that millennials are constantly bombarded with confusing information (thank the Internet) targeting them specifically. This has caused them to go through a range of emotions from extreme eagerness to extreme boredom, from self-confidence to self-sabotage, all in one day. Not to mention, they are also highly competitive with each other, which means that you have a highly-charged atmosphere that is not usually pleasant. Conflicts, problems, difference of opinions, etc., may be some of the most common problems faced when working with millennials. To make the experience pleasant for them as well as for the company, it is essential that they are given regular coaching, training, and mentorship. The coaching should not just equip them with tools of the trade but also with cores of leadership and relationship building. They need to be trained to direct their energy and to sometimes accept the reality of daily routine. Not all days will be dynamic or innovative and not all days will be fun or full of life. There will be days when productivity is slow, when tasks are completed, and when there’s not much left to do. This certainly doesn’t mean that they should consider quitting their jobs to chase something that is unrealistic and unachievable. Consistency and perseverance are keys to success, and that’s what most millennials need to know. The SMART (Specific, Measurable, Achievable, Relevant) plan is an ideal way to help millennials find their direction and their goals. Most millennials feel lost at their organization because there is no room nor space for measuring SMART goals. As part of the HR structure, quarterly SMART goals such as learning a new skill and applying them to tasks at hand, provide training to other colleagues, etc., can play a great role in helping millennials focus on developing their skills and also performing well at work. These goals should also be rewarded in the form of bonuses or incentives which ensure that their effort does not go to waste. Millennials have the toughest time working in a controlled environment that does not allow room for creativity or flexibility in working styles. For example, most people feel comfortable working some days from home, but preventing them from doing so results in demotivation and gives them a reason to leave the company to look for better options. Companies should realize that technology has dynamically changed the way we work and while we may not be physically present in an office, it does not hamper the productivity or task at hand. Flexible working conditions are important for employees to feel free and productive. Leaders often make the mistake of micromanaging millennial employees because they have biased assumptions against the working style of the employee. Millennials avoid micromanagement like the plague. They want to be trusted, to be taught, and to be empowered enough to do their work and drive their career forward, challenging themselves every step of the way. The quickest way to have great talent leave your company is enforcing them to follow a rigid management style where you become the dictator instead of being the facilitator. Anyone can be a manager, but not many can be successful leaders. Leaders are visionaries who also know the art of helping people achieve their goals without destroying their personality or their potential. Leaders go beyond the nitty gritty aspects of management and focus on the bigger picture. Millennials crave these sorts of positions and opportunities where they can shine and show their potential for being leaders. Guide them towards this direction and you will be creating leaders for tomorrow. Millennials were either born into technology or were the youngest users of it. Therefore, they are always on the lookout to make use of the most efficient ways to work, communicate, and collaborate. They are gurus when it comes to using multiple communication and social apps, all which play a great role in getting work done faster. Give them room to search, to experiment, to play, and to come up with new ideas that could change how you would traditionally do things. Organizations need to understand that if they are to meet the demands of new-age technology and work processes they ought to trust millennials with their capabilities and their potential to drive change. Of course, guidance and mentorship will play an important role in ensuring that ideas for innovation are streamlined into an efficient process for the organization to benefit from. Today’s millennials are tomorrow’s businessmen, change influencers, social drivers, and leaders. But they cannot proceed with their dreams and goals if they don’t get the right guidance and mentorship from the generation that raised them. People from the Baby Boomer generation should pass on professional and ethical values for the young generation because, without their help, millennials will be stuck in a chaotic rut and will not know how to direct their lives for their own good and for the good of others. Lastly, millennials should be judged and criticized for who they are but should be accepted and trained to become better versions of themselves.